I have to say I’m very sorry to see the end of the Butterfly Hunter series, I can ‘t have enough of these characters. I would like to read a whole book/series about Robin, or another one on Simon, or Charlie, I would even read a het novel about Denise and Vittorio love. Not just them, all the persons I met during the amazing adventure reading this series was, caught my interest, they made me curious to know so much more and honestly I think it’s something it happened to me very few times. The Thousand Smiles of Nicholas Goring (I love the title) was perfect conclusion for a series that truly filled my heart with so much love and hope, I was smiling thousand smiles too. In this last installment things became a little complicated for my beloved couple, starting with the arrival in Australia of Nicholas’s nephew, Robin, then the aneurysm that hit Nicholas and ending with the desperate try at saving the waterhole and the new butterflies. With all these occurrences, the book is fast paced, filled with secondary characters to discover and love. I shared with them so many laughs and a couple of tears when Nicholas was fighting for his life. What more pulls at my heart was the magic I felt through all the book (and series), the deep love that runs deep for the husband, for ex lovers, for the family and friends, and deeper for the land. The huge respect for their region moved me, especially considering how we are treating and destroying the Earth right now. This entry was posted in Books, Contemporary fiction, eBooks, LGBTQ Book Reviews, M/M Book Reviews, M/M Contemporary Fiction, M/M Fiction, M/M Romance, Uncategorized and tagged A Stella Highly Recommended Story and Series, A Stella Review: The Thousand Smiles of Nicholas Goring (Butterfly Hunter #3) by Julie Bozza, author Julie Bozza, Butterfly Hunter series by Julie Bozza, The Thousand Smiles of Nicholas Goring (Butterfly Hunter #3) by Julie Bozza. I read the previous edition of this title in the 2015 and I gave it three stars. I’m not sure how much this just released second edition of Butterfly Hunter is different, from what I understood the author made just minor editing. That said, I’m surprised to say I quite enjoyed the novel and I upgraded my rating at four stars and a half. It totally deserved them. I was very happy to meet Nicholas and Dave again, I remembered their story and the particularity of the plot caught my attention at the time. Yes, the plot is curious, I never heard or read a story like this one, but what perfectly worked here was the writing. It was so easily for me to be lost in the Outback with these men, to discover new butterflies, to fall in love. Every scene was so well depicted, I missed nothing, every new detail was mine to be seen. Moreover, I’m not sure how to describe it, I felt the magic, the sounds of the the words, a positive and luminous melody that lighted my spirit. I was gone. And I was conquered by the characters too. Both Nicholas and Dave were so good in their souls, there wasn’t a single hitch that can’t be overcome, their actions and thoughts flew easily. Even the fact that Dave has never been attracted to another man, and then he finds in the englishman the love of his life, it was not an issue (as it should be). The new attraction was considered and processed, not a little drama done. And you could think it’s not real, but you would be so wrong. In the extraordinary on the plot, the story sounded to me real, simple and sweet and powerful. I think it’s pretty clear I loved Butterfly Hunter a lot and it’s all Julie Bozza fault. The cover art by Gayna Murphy of Mubu Design is lovely, I like the colours and the style. Cute. This entry was posted in Book Reviews, Books, Contemporary fiction, eBooks, LGBTQ Book Reviews, M/M Book Reviews, M/M Contemporary Fiction, M/M Fiction, M/M Romance, Uncategorized and tagged A Stella Recommended Story, author Julie Bozza, Butterfly Hunter (Butterfly Hunter #1) by Julie Bozza, Butterfly Hunter series by Julie Bozza. Jules Madigan loves his family and he loves his job. The only thing he’s missing out on is a Happy Ever After, like the ones written by his favourite romance author Ewan Byge. While he’s waiting for that HEA, Jules indulges himself in buying Ewan’s old typewriter as memorabilia – before realising he’s been defrauded. Through the fraud case, he makes friends with Police Constable Leonard Edgar – and through Leonard, Jules even gets to meet and work with Ewan Byge Himself! But the course of True Love never did run smooth, and soon Jules has to face some harsh realities. I discovered Julie Bozza in the Butterfly Hunter series and fell in love with her style. That’s the reason I soon jumped into the chance at reading The ‘True Love’ Solution. What I particularly like of this author is her way with words, she can always bring me into real and at the same time dreamy worlds. This is exactly what I felt with this last story. I have to say Jules was my favorite, he has passion and a lot of love and care to spread around. How he loves his dad and his sister was deep and unconditional and this feeling flew easily to me thorught all the story. And he’s a greedy reader of romance, especially by his favorite author. And just this passion will lead him to be fraud, meet the cute Leonard and the same author in person. Although I quite enjoyed the characters and the writing a lot, I’m not a fan of love triangle and that’s the reason why I’m not giving The ‘True Love’ Solution a higher rating. Even if the interest between Jules and Ewan never actually evolved and Jules and Leonard weren’t together yet, it still felt to me like he was betraying Leonard and the potential HEA I was waiting for. The cover art by Natalia Bratslavsky is well done, I have to say I like all the covers by Manifold Press, plus I love flowers. 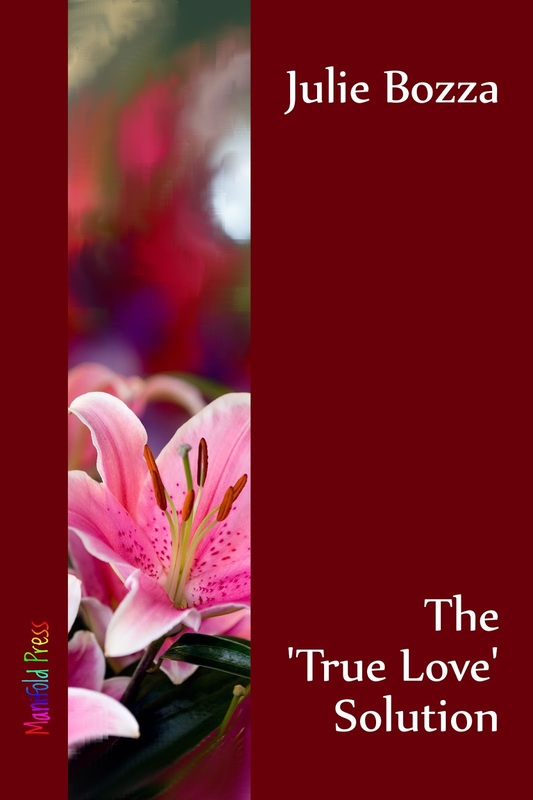 This entry was posted in Book Reviews, Books, Contemporary fiction, eBooks, LGBTQ Book Reviews, M/M Book Reviews, M/M Contemporary Fiction, M/M Fiction, M/M Romance and tagged A Stella Recommended Novel, A Stella Review: The ‘True Love’ Solution by Julie Bozza, author Julie Bozza, Manifold Press, The "True Love" Solution by Julie Bozza. 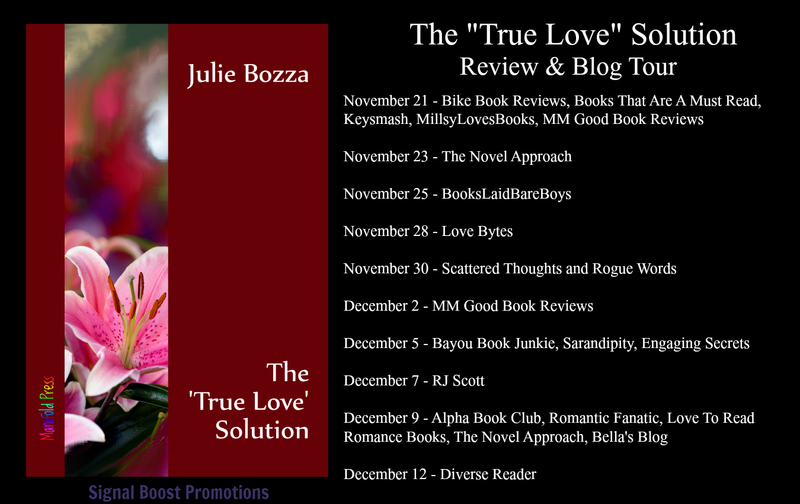 This entry was posted in Book Giveaways, Book Reviews, Book Tours and Contests, Books, Contemporary fiction, eBooks, LGBTQ Book Reviews, M/M Book Reviews, M/M Contemporary Fiction, M/M Fiction, M/M Romance, Uncategorized and tagged author Julie Bozza, Signal Boost Promotions, The "True Love" Solution by Julie Bozza.